So you moved to a retirement community! Raking leaves is soooo 10 years ago. Who needs a lawnmower—not you! Snow is just a pretty decoration because you don’t have to shovel it, or in some cases, even clean off your car. Some do miss these seasonal outdoor chores, but many don’t. The biggest change, however, is the fact that you no longer have to think about what’s for dinner, or lunch, or even breakfast. What a joy! My husband and I have the same exact conversation every day at around 5:30pm: What’s for dinner? I don’t know. What do you want? I don’t care. What do we have lying around that I can toss together quickly? I don’t know, eggs, a salad? And we end up usually having a salad, maybe with an omelet. Easy, but sooo boring. 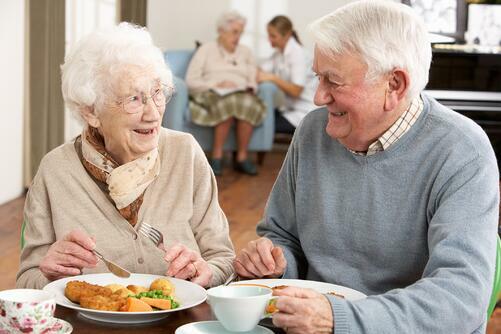 When you move in to a senior living community, you are sure to take advantage of the wonderful food options. Blueberry pancakes on a Tuesday? Why not! You would probably have a boring bowl of cereal, but not now. You can have eggs Benedict, grits and toast, and sausage. What’s for dinner? I bet it’s the soup of the day, a salad, an appetizer, an entrée, and a dessert. Oh and the desserts. No graham crackers or dry cereal for you! No sir! Cakes, pies, a wide selection of ice cream, Jell-O, crème brûlée, pudding, the works! Oh and lunch. You can have a cheeseburger or a BLT every single day if you want to. It’s no wonder that many put on what I like to call the “Freshman 15.” Just like when we went to college, we had this amazing buffet of options every day, and who am I to turn down these delectable items? I want to get my money’s worth! So I eat everything that is offered to me. But there are plenty of healthy options. You just need to practice a tiny amount of restraint with an eye toward weight management, and learn how to navigate the menu. Avoid the sauces. Try to stay away from stuff with lots of sauce on it. Always get the sauce on the side. Dip your fork in the sauce then in your food. That saves a little bit of calories. Eat more salad. Make a salad your entrée twice a week, instead of the side for your main course. Practice the same restraint with the salad dressing that you do with sauces. Even if you LOVE Parmesan peppercorn dressing, dip your fork in the dressing first and then stab it into your salad. Keep veggies healthy. See if you can get your vegetables steamed or roasted, without sauce or butter on them, with maybe a squeeze of lemon and salt-free seasoning. Increase your fiber. Fiber helps you feel more full and has lots of healthy side-effects. Pick whole-grain items off the menu, like brown rice, quinoa, wild rice, and whole-grain breads. Stick with sweet potatoes and skip the baked potato if possible. Enjoy healthy fish dishes. Look for the catch of the day and get it broiled or blackened, and always ask whether they prepare it with lots of butter or oil (and skip it if they do). Indulge occasionally. And finally, dessert. As hard as this is, choose two days a week that you can treat yourself to dessert, and see if anyone at the table wants to share it with you. Often the serving you get is really meant for two or even three, so don’t try to scarf it all down by yourself. I also suggest saving your dessert, taking it home, and having it for breakfast! Your body does a much better job of burning calories during the day, and by the evening your metabolism has begun to slow down to prepare for sleep. (Do you know how sumo wrestlers gain so much weight? They eat a big meal, about 2,000 calories, and then go right to sleep.) And who doesn’t love chocolate cake for breakfast? So enjoy the easy life; you have earned it! Just don’t get too carried away with the food options. You are in this for the long haul, and if you eat sensibly, get a little exercise, and get involved with programs and activities at your new home, you will truly make your new life the best it can be! Create a culture of wellness at your community, click below to learn more!